This study aimed to determine pre-service physics teachers’ perceptions concerning “Physics lab application.” Realized by employing phenomenology pattern, which is one of the qualitative research methods, this study aimed to reach into the life, thoughts, and perceptions of each individual which they have created through their own experience. Study group consists of 46 pre-service teachers enrolled at the department of physics education at the Faculty of Education of a state university in Ankara during the 2015-2016 academic year; and these pre-service teachers have successfully completed at least two lab classes. Data of the study were gathered via the “Physics Lab Application Metaphors Form,” which is designed by the researchers, and interviews were held with pre-service teachers on the metaphors obtained through this form. Data analysis and evaluation were realized by content analysis. At the end of the study, it was determined that metaphors expressed by pre-service teachers fall mostly under the conceptual category of learning through visual impact. At the same time, these pre-service teachers indicated that they had a good time during lab applications, they learn by doing/experiencing, and that they could concretize abstract concepts with the help of visuals. Araştırmada fizik öğretmen adaylarının “Fizik laboratuvar uygulaması” ile ilgili algılarının belirlenmesi amaçlanmıştır. Nitel araştırma yöntemleri içerisinde yer alan olgu bilim deseninden yararlanılarak gerçekleştirilen araştırmada, her bir bireyin kendi deneyimleri ile oluşturduğu yaşam dünyasına, düşüncelerine ve algılarına ulaşılmak istenmiştir. Araştırmanın çalışma grubunu 2015-2016 eğitim ve öğretim yılında Ankara’da bulunan bir devlet üniversitesinin eğitim fakültesinin fizik öğretmenliği bölümünde öğrenim görmekte ve en az iki laboratuvar dersini alarak başarılı bir şekilde tamamlamış olan 46 öğretmen adayı oluşturmaktadır. Araştırmanın verileri araştırmacılar tarafından hazırlanan “Fizik Laboratuvar Uygulaması Metaforlar Formu” aracılığıyla toplanmış ve elde edilen metaforlara yönelik öğretmen adayları ile görüşmeler yapılmıştır. Araştırmada verilerin çözümlenmesi ve yorumlanması içerik analizi ile gerçekleştirilmiştir.Araştırmanın sonucunda öğretmen adayları tarafından ifade edilen metaforların çoğunluğunun görsel etkiyle öğrenme kavramsal kategorisi altında yer aldığı saptanmıştır. Aynı zamanda adayların laboratuvar uygulamalarında eğlendikleri, yaparak yaşayarak öğrendikleri ve soyut kavramları görsellikle somutlaştırabildikleri belirlenmiştir. Açışlı, S. (2014). Genel fizik laboratuvar uygulamalarında 5e öğrenme modeline göre geliştirilen materyallerin öğrencilerin bilimsel süreç becerilerine ve akademik başarılarına etkisinin incelenmesi [The examination of the effect of the materials developed accordings to the 5e learning model on the students’ scientific process skills and academic achievement in general physics laboratory applications]. 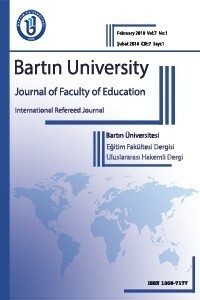 Ondokuz Mayis University Journal of Faculty of Education, 33(2), 628-641. Akben, N. (2011). Öğretmen adayları için bilimsel sorgulama destekli laboratuvar dersi geliştirme [Developing a laboratory-guided laboratory course for prospective teachers]. Unpublished Doctoral Dissertation, Gazi University, Ankara. Alpaut, O. (1993). Fen eğitiminin verimli ve işlevsel hale getirilmesi [Making science education efficient and functional].Symposium on science education and problems in secondary education institutions, TED, Ankara. Arnett, R. C. (1999). Metaphorical Guidance: Administration as Building and Renovation. Journal of Educational Administration, 37(1), 80-89. Ayas, A. (2006). Fen bilgisi öğretiminde laboratuar kullanımı [Use of laboratories in science teaching]. Anadolu University Publications. Boud, D., Dunn, J., & Hegarty-Hazel, E. (1986).Teaching in laboratories. Guildford: SRHE & NFER-Nelson. Bozkurt, E. & Sarıkoç, A. (2008). Fizik eğitiminde sanal laboratuar, geleneksel laboratuarın yerini tutabilir mi? [Can the virtual laboratory replace the traditional laboratory in physics education?]. Ahmet Kelesoglu Education Faculty Journal, 25, 89-100. Cerit, Y. (2008). Öğretmen kavramı ile ilgili metaforlara ilişkin öğrenci, öğretmen ve müdürlerin görüşleri [Students, teachers, and administrators’ views on metaphors with respect to the concept of teacher]. The Journal of Turkish Educational Sciences, 4(6), 693-712. Christensen, B. L., Johnson, R. B., & Turner L. A. (2011). Research methods, design and analysis. Boston: Pearson. Collette, E. L. & Chiapetta, A. (1989). Teaching science in middle and secondary schools. Berril Publishing Company, Toronto. Creswell, J. W. (2003). Qualitative, quantitative, and mixed methods approaches (2nd ed.). London: Sage. Çallıca, H., Erol, M., Sezgin, G., & Kavcar, N. (2001). İlköğretim kurumlarında laboratuar uygulamalarına ilişkin bir çalışma [A study on laboratory practices in primary education institutions]. IV. Science Education Symposium, Milli Eğitim Publications, Ankara. Çepni, S., Ayas, A., Johnson, D. & Turgut, M. F. (1997). Fizik Öğretimi [Physics Teaching]. Ankara: YÖK/Dünya Bankası National Education Development Project, Pre-Service Teacher Training. Çifçili, V., & Kırbaşlar, G. F. (2015). Investigating perceptions of pre-service teachers towards laboratories by using phenomenological pattern. Procedia-Social and Behavioral Sciences, 174, 1371-1378. Çilenti, K. (1985). Fen eğitimi teknolojisi [Science education technology]. Ankara: Kadıoğlu Publications. Domin, D. S. (1999). A content analysis of general chemistry laboratory manuals for evidence of higher-order cognitive tasks. Journal of Chemical Education, 76(1), 109-111. Ekici, G. (1996). Biyoloji öğretmenlerinin öğretiminde kullandıkları yöntemler ve karşılaştıkları sorunlar [The aim of this study is to determine the methods used by biology teachers in biology education and the problems they experience]. Masters Dissertation, Ankara University, Ankara. Erişti-Bedir, D. S., & Akbulut-Tekin, S. A. (2014). Anadolu üniversitesi endüstriyel sanatlar yüksekokulu modatasarımı bölümü öğrencileri örneğinde sanatsal tasarım ürünlerine dayalı kültür algısı [Culture perception through artistic design process at the sample of anadolu university fashion design department students]. Journal of Qualitative Research in Education, 2(1), 9-37. Feyzioğlu, B., Demirbağ, B., Ateş, A., Çobanoğlu, İ., & Altun, E. (2011). Kimya öğretmenlerinin laboratuvar uygulamalarına yönelik algıları: İzmir ili örneği [Chemistry teachers’ perceptions on laboratory applications: Izmir sample]. Educational Sciences: Theory& Practice, 11(2), 1005-1029. Garnett, P. J., Garnett, P. J., & Hackling, M. W. (1995). Refocusing the chemistry lab: a case for laboratory-based investigations. Australian Science Teachers Journal, 41(2), 26-32. Garnett, P. J. & O'Loughlin, M. O. (1989). Using practical tests to assess laboratory work in chemistry. Australian Science Teachers Journal, 35(4), 27–37. Goldstein, L. B. (2005). Becoming a teacher as a hero’s journey: Using metaphor in pre-service teacher education. Teacher Education Quarterly, 32(1), 7-24. Gunstone, R. F., & Champagne, A. B. (1990). Promoting conceptual change in the laboratory. In E. Hegarty-Hazel (Ed. ), The student laboratory and the science curriculum (pp. 159–182). London: Routledge. Güneş, H. M., Şener, N., Germi, T. N., & Can, N. (2013). Fen ve teknoloji dersinde laboratuvar kullanımına yönelik öğretmen ve öğrenci değerlendirmeleri [Teacher and student assessments regarding to use of science and technology laboratory]. Dicle University Journal of Ziya Gokalp Faculty of Education, 20, 1-11. Halloun, I. (1997). Schematic concepts for schematic models of the real world: The Newtonian concept of force. Department Of Physics & Astronomy, Arizona State University, Box 871504, Tempe, AZ 85287- 1504, USA. Hodson, D. (1988). Experiments in science and science teaching. Educational Philosophy and Theory, 2, 53–66. Hofstein, A. (2004). The laboratory in chemistry education: thirty years of experience with developments, implementation and research. Chemistry Education: Research and Practice 5(3), 247-264. Hofstein, A. & Lunetta, V. N. (1982). The role of the laboratory in science teaching: Neglected aspects of research. Review of Educational Research, 52, 2, 201-217. Hofstein, A., & Lunetta. V. N. (2003). The laboratory in science education: Foundations for the Twenty-First Century. Science Education, 88(1), 28-54. Hofstein, A., Navon, O., Kipnis, M., & Mamlok-Naaman, R. (2005).Developing students’ ability to ask more and better questions resulting from inquiry-type chemistry laboratories. Journal of Research in Science Teaching, 42, 791-806. Hofstein, A., & Naaman, R. M. (2007). The laboratory in science education: The state of the art. Chemistry Education Research and Practice, 8(2), 105-107. Hofstein, A., Shore, R., & Kipnis, M. (2004). Providing high school chemistry students with opportunities to develop learning skills in an inquiry-type laboratory: A case study. International Journal of Science Education, 26, 47-62. Kesercioğlu T. & Aydoğdu M. (2005). İlköğretimde fen ve teknoloji öğretimi [Teaching science and technology in primary education]. Ankara: Anı Publications. Lawson, A. E. (1995). Science teaching and the development of thinking. Wadsworth Press, California. Miles. M. B. & Huberman, A. M. (1994). An expanded source book qualitative data analysis. Thousand Oaks, California: Sage Publications. Patton, M. Q. (2014). Nitel araştırmada çeşitlilik, kuramsal yönelimler [Diversity in qualitative research, theoretical orientations]. M. Bütün& S. B. Beşir (Ed.). Within qualitative research and evaluation methods (pp. 75-142). Ankara: Pegem Academy Publications. Pickering, M. (1980). Are lab courses a waste of time?. The Chronicle of Higher Education, 19, 80. Saban, A. (2009). Prospevtive teachers’ mental images about the concept of students. The Journal of Turkish Educational Sciences, 7(2), 281-326. Sarı, M. (2013). İlköğretim fen ve teknoloji dersinde yer alan fizik konularının öğretiminde laboratuvarın yeri ve basit araç-gereçlerle yapılan fizik deneylerinin öğretmen adaylarının görüşlerinden yararlanarak değerlendirilmesi [Call center located in the teaching of physics topics in science and technology lab in the physics experiments and simple tool-instrument taking advantage of evaluation of teacher candidates’ views]. Journal of Research in Education and Teaching, 2(2), 115-121. Şahin-Pekmez, E. (2001). Fen öğretmenlerinin bilimsel süreçler hakkındaki bilgilerinin saptanması [Identification of science teachers' knowledge of scientific processes]. Beginning of the New Millennium Science Education Symposium in Turkey this year, Maltepe University, İstanbul. Tatar, N., Korkmaz, H. & Ören, F. Ş. (2007). Araştırmaya dayalı fen laboratuvarlarında bilimsel süreç becerilerini geliştirmede etkili araçlar: Vee ve I Diyagramları [Effective tools to develop scientific process skills in research-based science laboratories]. Elementary Education Online, 6(1), 76-92. Tobin, K. G. (1990). Research on science laboratory activities: In pursuit of better questions and answers to improve learning. School Science and Mathematics, 90, 403-418. Woolnough, B. (Ed. ), (1991). Practical science. Milton Keyes: Open University Press. Yalım, H. İ. (2002) Öğretim teknolojileri ve materyal geliştirme [Teaching technologies and material development ]. Ankara: Nobel Publications. Yenice, N. (2005). İlköğretim fen ve teknoloji eğitiminde laboratuvar uygulama ve yöntemleri. M. Aydoğdu ve T. Kesercioğlu (Ed.). İlköğretimde fen ve teknoloji öğretimi [Teaching science and technology in primary education]. Ankara: Anı Publications. Yıldırım, A. & Şimşek, H. (2013). Sosyal bilimlerde nitel araştırma yöntemleri [Qualitative research methods in the social sciences]. Ankara: Seçkin Publications.